Back in 2005, a group of merchants sued Visa (V), MasterCard (MA) and other credit card processors for allegedly conspiring to fix so-called swipe fees at unfairly high levels. They managed to settle their differences, with 7 million merchants splitting $6 billion in damages under a proposed deal. While a number of retail groups are still up in arms over the settlement, which still needs final approval, investors appear to be pretty happy that the big card companies seem to be emerging relatively unscathed. That certainly appeared to be a prescient move. The mobile payments start-up created by Twitter co-founder Jack Dorsey serves more than 8 million customers a day through its mobile apps. And Square recently landed a major deal with Starbucks (SBUX). While Square is clearly a dominant force, it's not the only game in town. Just last month, Verizon (VZ), AT&T (T) and T-Mobile announced plans to launch a mobile commerce network, named Isis, in two cities. That's a good point. What comes up must come down, or something like that. But in all seriousness, when stocks are at the top of their game there's a tendency to start trying to time the fall. But in the case of Visa and MasterCard, they have pretty decent fundamentals. Earlier this month, Visa reported better-than-expected earnings and saw its price target raised by several analysts. 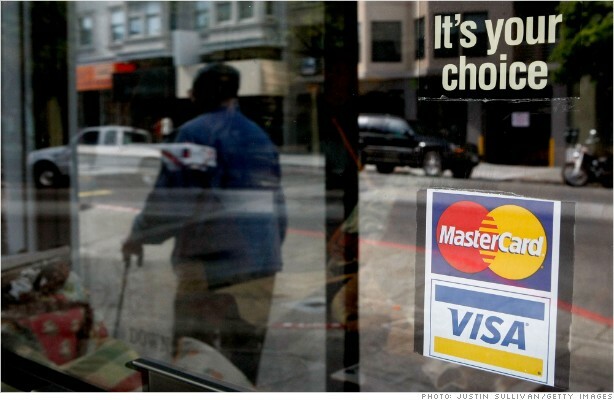 MasterCard also beat on earnings and lowered its expenses. Most recently, MasterCard has been trying to diversify through selective partnerships. So there still may be some room to run. TwentyOne:take a look at the weeklies on $V and $MA ... watching every tick and freaking out over media noise will shake you out of huge winners.